This may mean that the Internet connection between your Xbox console and the Xbox Live servers is slow. Try to download the content again to see if the connection problem was temporary. If you still can’t download the content, try the next solution. In some cases, there’s a firewall on the router or modem that blocks the download. If so, the fastest way to get that download to your console may be to simplify your network setup. To do this, follow these steps to establish a direct connection between your console and your modem through an Ethernet cable. Note Don’t plug any other devices into your modem. 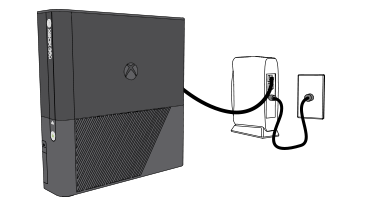 Plug the Ethernet cable from the Xbox to the modem. Unplug the power cord from the back of the modem. After 1 minute, plug the modem in first, and then wait for all the lights to return to their normal state. Test your Xbox Live connection. To do this, go to settings, then System Settings. Select Network Settings, select Wired Network and then select Test Xbox Live Connection. Note If you can connect to Xbox Live with a direct-modem connection, your console and modem are working as expected. To connect to Xbox Live using your router, you might need to change a setting on your router. For information about how to configure your router, see the Xbox forums. Sign in to Xbox Live and then try to download your profile again. Once your setup is simplified, try to download the content again. If you have the same problem, try the next solution. While the download is in progress, don’t use your Xbox 360 console to play games or perform other activities. Using the console while downloading content might cause the download to pause, stop or be timed out. If you stay on the download screen but continue to have the problem, try the next solution. Downloading can fail if your Internet service provider (ISP) has set bandwidth or connection-time limits. Contact your ISP to determine whether there are any restrictions that can cause your connection to time out. To resolve this issue, try the Xbox Live slow performance solution. Would you like to contact Support regarding the "Error 80072EE2 occurs when downloading content on Xbox Live" issue you were reading about or a different issue?